Holidays in Muscat transport you to the capital city of Oman, which is a stunning white port city with a world of unassuming luxury. The city effortlessly combines history and heritage, with a taste of old Arabia blending with modern amenities and height restrictions on buildings to ensure there are unobstructed views of the rugged Al Hajar Mountains in the background. Families will love the peaceful golden sands of Qurum Beach and the neighbouring family-friendly restaurants, while the more adventurous can test their bartering skills in the Mutrah Souq, the oldest in Oman. Take a stroll through the maze of alleys and admire exquisite architecture with doorways decorated with delicate mosaics and filigree shutters. Be sure not to miss the jewel in Muscat’s crown, the Sultan Qaboos Grand Mosque, which is adorned with a towering dome and striking minarets. Enter a world of grandeur and ornate architecture giving you a glimpse of rich Arabian history. Luxury holidays in Muscat offer visitors a wealth of surprises too, including the impressive Italian-Arabic Royal Opera House, which is also home to steakhouses and intimate French bistros. Old Muscat lies in the eastern quarter of the city and is guarded by two waterside forts where you’ll find a wealth of cultural delights, such as royal places. At Sovereign we’ve put together a selection of some of the best hotels in the area. 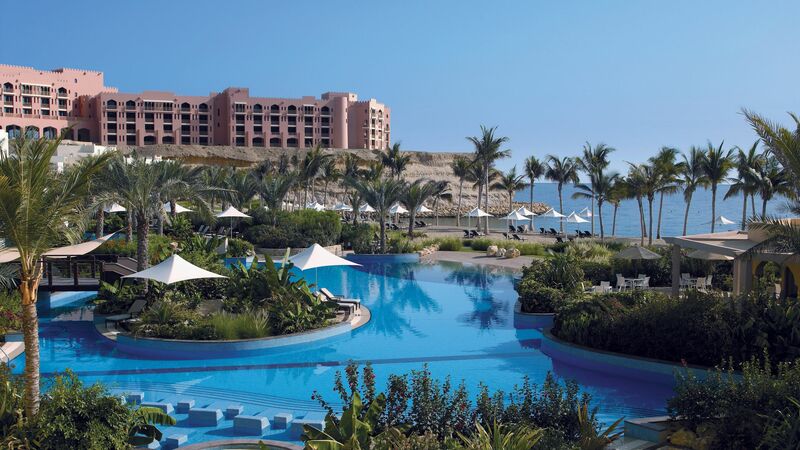 Stay at the Shangri-La Al Husn Resort and Spa, which resembles a real Arabian Palace. Experience opulent and majestic accommodation perched on a clifftop overlooking the Gulf of Oman, perfect for a couples’ retreat. 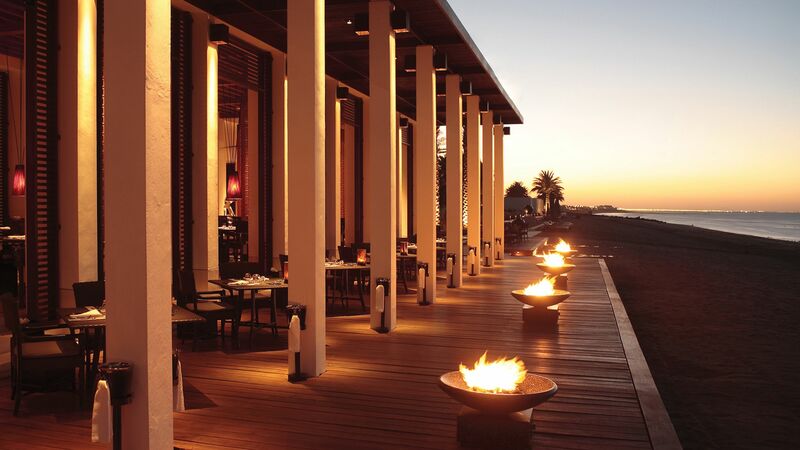 The Chedi Muscat is a fantastic base for exploring the rest of this exciting region. 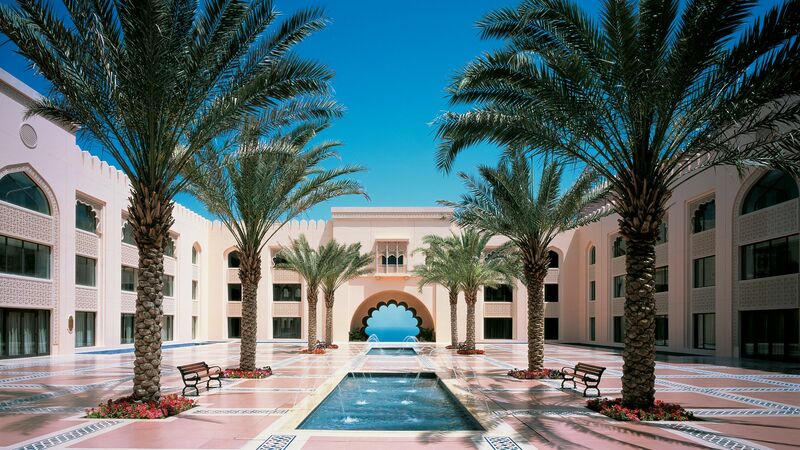 Enjoy timeless elegance, authentic Arabic mezze and one of the largest spas in Muscat. Wherever you choose to stay with Sovereign, you will receive advice and knowledge from our Trusted Advisers, who are expertly skilled in creating a holiday for you to remember. Flight time from the UK to Oman starts at 7 hours 30 minutes. The best time to visit Oman is in autumn and spring. Temperatures waver between 23°C and 30°C, although nights can cool down considerably. That’s down to the desert climate, which also contributes to Oman’s very dry summers. The winters see occasional rainfall that appears in short, sharp bursts. Temperatures frequently soar past 40°C between June and September. Wondering where all those dunes come from? Winds blow through between March and August, whipping up the desert sands. You can expect plenty of sunshine all year round, too: at least eight hours a day on average. British nationals don’t need to get a visa in advance. You’ll receive one when you arrive in Oman. It’s best to tip around 10% in high-end or hotel restaurants. Elsewhere in Oman, a tip isn’t expected – but rounding up the bill to the nearest rial for good service is appreciated.